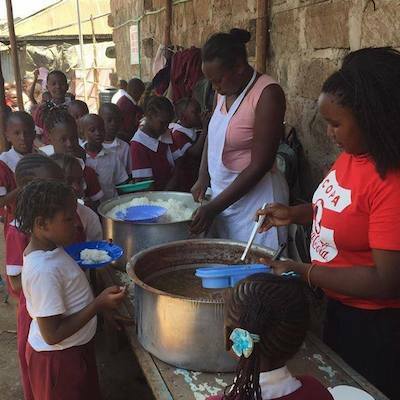 Child hunger is widespread among school children in the slums of Nairobi, due to poverty, neglect and lack of nutritional knowledge. A black tea and a sometimes a mandazi (an unsweetened African doughnut) is a common breakfast with nothing for lunch. It is no surprise that children frequently complain of stomach pain and nausea. At first, the feeding programme focussed on hunger prevention, and helping to keep the children alert during the school day. In a short period of time, though, it became apparent that there is an opportunity here to have a greater and wider impact on the the community's health. As well as a six-monthly review of the schools' menu plans to ensure they are nutritionally balanced and addressing common deficiencies, Porridge and Rice also run nutrition classes for the parents of children at partner schools, so that they can also understand how to support their family's health through their food choices. The results so far have been very positive, and while there have been cultural barriers to overcome (the children show a strong preference for rice, which makes them less hungry, over beans, which give them nutrients), the children in the partner schools have had more energy, better attendance, lower sickness and better results than before the programme was introduced. Playtime is definitely noisier! Three micronutrient deficiencies are widespread in the Nairobi slums namely vitamin A, iodine, and iron, each having severe consequences. The meal plan for the schools has been adapted to address these common deficiencies. Vitamin A deficiency is the leading cause of preventable blindness in children and increases the risk of disease and death from severe infections. Vitamin A deficiency is a public health problem in Africa, hitting young children and pregnant women hardest. Supplying adequate vitamin A can significantly reduce mortality. Conversely, its absence causes a high risk of disease and death. Between 250 000 and 500 000 vitamin A deficient children become blind every year; half of them die within 12 months of losing their sight. A lack of vitamin A also impairs immunity increasing the risk of severe illnesses, and even death, from common childhood infections such as diarrhoea or measles. The impact of supplements on childhood mortality is as great or greater than that of any one vaccine – and it costs only a few pence a dose with dramatic effects like reducing blindness and premature death. The absorbed quantity of vitamin A capsules only lasts 4-6 months, and fortified foods are expensive. The Porridge and Rice approach is to provide a vitamin A rich diet with foods like sweet potato, especially rich in the nutrient. As breast milk is a natural source of vitamin A, promoting breastfeeding is the best way to protect babies. Iodine deficiency is one of the main causes of impaired cognitive development (permanent brain damage) in children living in poverty. Some of the consequences of iodine deficiency are stillbirths, spontaneous abortions, and congenital abnormalities such as cretinism, a grave, irreversible form of mental retardation. Probably the worst consequence of iodine deficiency is the less visible, yet pervasive, mental damage that reduces intellectual capacity permanently limiting individual and national potential. Iodine deficiency is a public health problem. According to UNICEF, there are 54 countries where iodine deficiency is still a serious problem. Iodized salt is the simple and effective solution. It is widely available and cheap. All Porridge and Rice meals add iodized salt ensuring that no pupil at a Porridge and Rice school will suffer from Iodine deficiency. As well as affecting a large number of children and women in developing countries, it is the only nutrient deficiency which is also significantly prevalent in industralized countries. The numbers are staggering: 2 billion people – over 30% of the world’s population – are anaemic, many due to iron deficiency. In developing countries, iron deficiency is aggravated by worm infections, malaria and other infectious diseases such as HIV/AIDS, hookworm infestation, schistosomiasis, and tuberculosis. The inviduous nature of this deficiency is that its greatest impact is not easy to observe or measure, and is frequently obscured by other more visible concerns. It is a significant cause of ill-health, premature death and lost earnings. The WHO estimate that eliminating iron deficiency for developing countries can raise national productivity levels by as much as 20%. 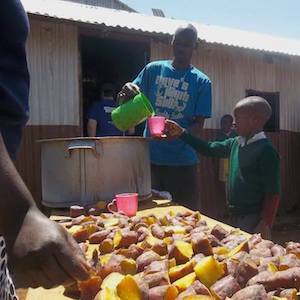 The Porridge and Rice menu is designed to meet the iron needs of the children it feeds. It includes large quantities of rosecoco beans and kale four times a week as both are high in iron.